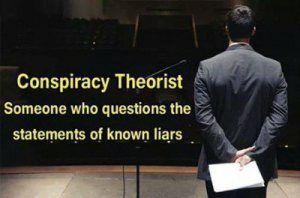 Message to Citizens: Wake Up! by Lisa Siegal Belanger, Esq. For more than five years, my sister, Devora, and I have been vigilantly pursuing and defending our family’s right—and all other citizens’ rights—to be free from tyranny by our local government. Since 2011, without any legitimate or valid basis whatsoever, Massachusetts public officials involved with the Probate & Family Court began their trampling of our family’s rights to due process and to protection of the integrity of the family unit guaranteed by the U.S. Constitution. After years of my personally going to various counties of the Massachusetts Probate & Court system, viewing and obtaining public court records of inordinate other families litigating guardianships and conservatorships, beyond a doubt, this is happening EVERY SINGLE DAY in Massachusetts—which documentation is all publicly accessible and filed in the Massachusetts Federal District Court under the civil action of Belanger, et al. v. BNY Mellon, et al (Docket no. 1:15-cv-10198-ADB). Moreover, this happens to private citizens regardless of how much money they have—rich or poor. The only prerequisite is that the victim receives some form of governmental benefit. The bread and butter of this probate court industrial complex is Medicaid/Medicare fraud. For some reason, Auditor Suzanne Bump does not wish to conduct an audit of court appointed guardians and conservators. The filed court documentation overwhelmingly shows that Massachusetts citizens are ALL for the taking by these probate court predators, being cloaked under the color of law and protected by AG Healey. Just like the non-stop, talk radio ads that claim to “protect your money and family from the probate court” if you hire them to prepare written instruments that the probate court supposedly has to abide by, our father, Marvin Siegel, a retired attorney having practiced law in Downtown Boston for over 50 years, spent large sums of money hiring prominent, expert attorneys to prepare such written instruments. He did so believing that his family would never have to be subjected to dealing with the probate courts. Especially as an attorney, our father executed a Durable Power of Attorney particularly designed to keep him from never having to suffer public humiliation by being judicially declared incompetent. In filed attestation, Attorney Marsha V. Kazarosian—Governor Baker’s January 2016 appointee to the Supreme Judicial Court Nominating Committee—outright acknowledged that she was privately hired directly by our father to protect and to keep HIS outwardly expressed desires and intentions. 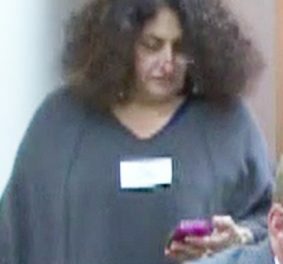 Not only did Attorney Kazarosian fail to take the most basic and elementary measures from the inception of her legal representation, in just a few short months she actually led the charge of the now cabal of attorneys adversarial to the interests of her own client—isolating him from his family and friends, unlawfully drugging him with antipsychotics and liquidating his assets for her own personal gain. Specifically, on August 17, 2011, Attorney Kazarosian filed a written affidavit with the Essex Probate & Family Court, stating under oath—and describing in painstakingly detail—that our father was fully competent and capable of handling his own personal affairs, as well as, openly representing in court that our father personally desired for our family to permanently reside together; stating that he particularly so enjoyed our company and dedicated care that we provided to him every day and night. And on December 11, 2011, within three (3) months of retaining Attorney Kazarosian, our father personally demanded in writing that Attorney Kazarosian terminate her legal representation of him. The culminating event that led to our father’s written, faxed demand consisted of Attorney Kazarosian’s direct and personal actions of aiding and abetting the unjustified removal of me, my husband, and our two children from the family home and prohibited us from all living together. 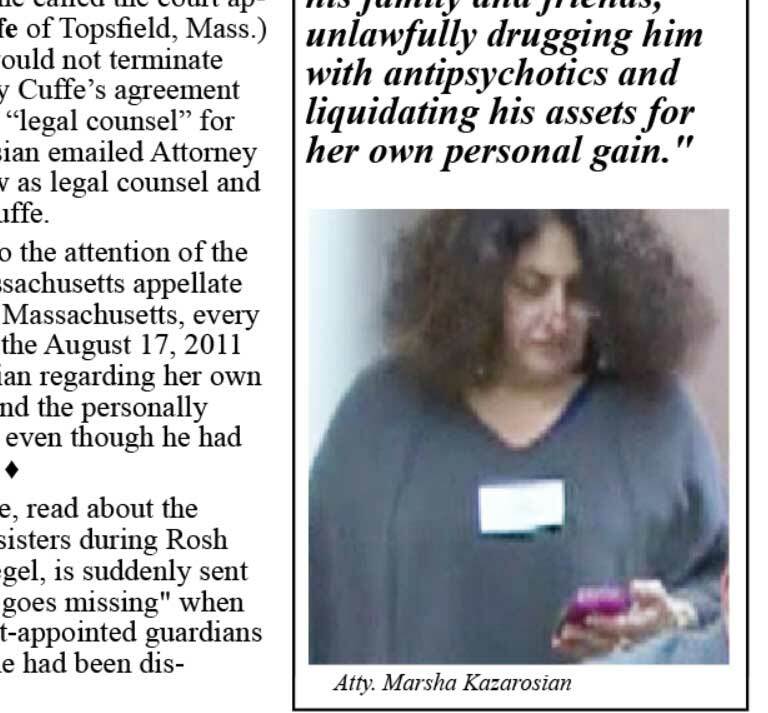 Upon Attorney Kazarosian having received our father’s faxed demand for termination of legal representation in his status as a client, she called the court appointed guardian (Attorney Brian Cuffe of Topsfield, Mass.) and informed Attorney Cuffe that she would not terminate her legal services – resulting in Attorney Cuffe’s agreement that he allow her to continue her role as “legal counsel” for our father. Thereafter, Attorney Kazarosian emailed Attorney Cuffe to confirm her refusal to withdraw as legal counsel and such refusal was blessed by Attorney Cuffe. Legal corruption & medical malpractice racketeers are involved in infarct assaulting, stalking/abducting, money laundering & homicide poisoning rackets. Who dictates them, is the problem. As MORE corruption terrorised/assaulted victims & their decieved family members/relatives are helped & encouraged to come forward with what they witnessed/wet through it is very evident that Justice & public guardian/trustee departments, property agents & unscrupulous judges & medical personnel are directly involved in & dictate constituants poisoning assaults, homicide poisoning & money laundering malpractice rackets.